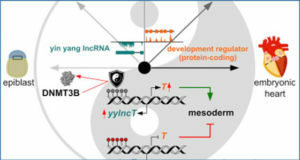 Although numerous long non-coding RNAs (lncRNAs) have been identified to be important in human cancer, their potential regulatory roles in epithelial tumorigenesis and tumor progression in ovarian cancer remain unclear. 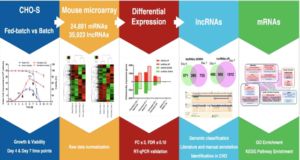 Researchers from Nanjing Medical University set out to investigate lncRNAs that were differentially expressed (DE) in epithelial ovarian cancer and to explore their potential functions. 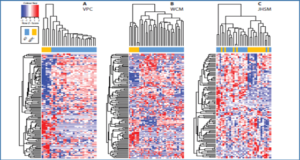 The lncRNA profiles in five pairs of human epithelial ovarian cancer tissues and their adjacent normal tissues were described using microarrays. 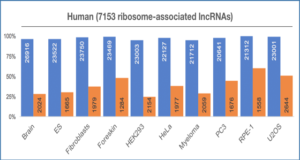 The results of the microarray analysis revealed that 672 upregulated and 549 downregulated (fold-change ≥2.0) lncRNAs were DE between the cancerous and normal tissues. Reverse transcription-quantitative polymerase chain reaction was used to validate the microarray results using four upregulated (RP11-1C1.7, XLOC_003286, growth arrest-specific 5 and ZNF295-AS1) and four downregulated (protein tyrosine kinase 7, maternally expressed gene 3, AC079776.2 and ribosomal protein lateral stalk subunit P0 pseudogene 2) lncRNAs. 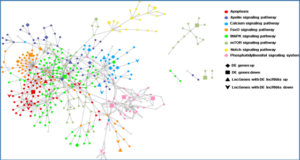 Furthermore, gene ontology and pathway analyses were used to carry out functional analyses of the candidate genes of DE lncRNAs. 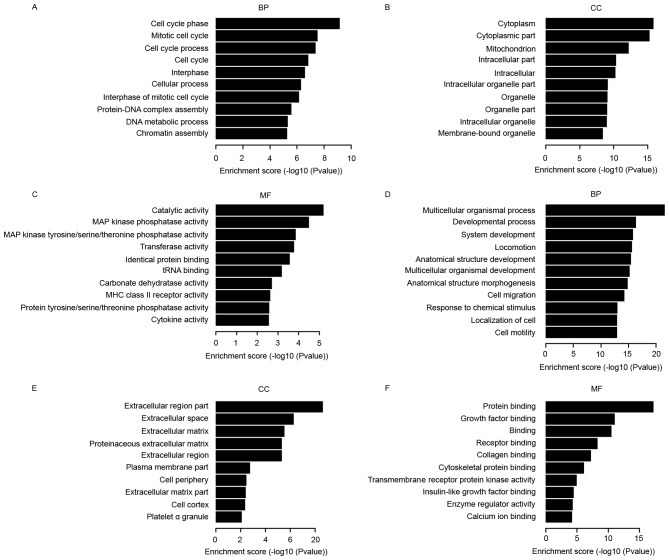 The results identified lncRNAs with significantly altered expression profiles in human epithelial ovarian cancer cells compared with those in adjacent normal cells. These data offer new insights into the occurrence and development of epithelial ovarian cancer, and these lncRNAs may provide novel molecular biomarkers for further research on epithelial ovarian cancer. The bar plots show the 10 most significant enrichment terms with the most number of differentially expressed genes. The ontology covers three domains: BP, CC and MF. (A-C) Upregulation in cancer vs. normal cells. 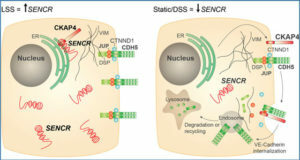 (D-F) Downregulation in cancer vs. normal cells. MAP, mitogen-activated protein; MHC, major histocompatibility complex; BP, biological processes; CC, cellular components; MF, molecular function.